There are numerous possibilities when it comes to building and detailing a model. The following list gives some idea of the options available. Our initial discussion will identify the kind of model you need and the level of detailing you require. Although 3D-CAD can be extremely informative, there’s nothing quite like holding a beautifully-crafted, tangible model. Detailing is kept simple, with the emphasis on shape and design. 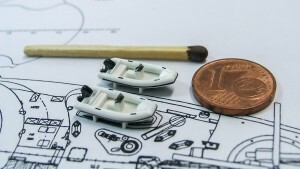 These models normally show the hull and the major superstructure elements. Traditionally finished in plain wood or with a high-quality varnish, they’re the perfect choice for elegant sailing yachts. Fully detailed display models which match the original exactly. The level of detail depends on the client’s wishes and budget. The production of highly detailed miniatures, for example to a scale of 1:400, is one of our particular strengths. These models make ideal presents for your clients. We create models of industrial plants and machinery, as well as architectural models.